After returning home from the Delmarva Paddler’s Retreat, I hopped in the car to head north for Lumpy Waters, which is put on by Alder Creek. I took the coastal route, and both the weather and ocean conditions were gorgeous, a good sign for the days ahead. This event has taken place for five years, although it was my first time going. Lumpy Waters takes place at the Cape Kiwanda RV Park, which hosts a number of cabins, as well as RV and tent sites. Across the street is the Pacific Ocean, and the clear weather provided spectacular views. A large room and tent had been set up as a warm place for people to mingle, and outside a fire kept people toasty. Participants had numerous classes to pick from, and class rosters were displayed on large paper on the wall. The event started Friday afternoon with half day programs. I taught Simplifying the Roll at nearby Nestucca Bay. 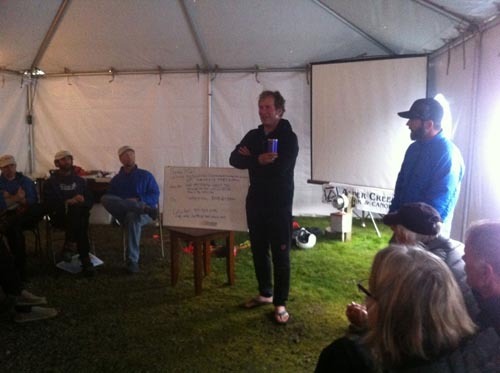 Karl Andersson discusses weather and marine forecasts, as well as local logistics and safety during the coaches meeting. The second day of the event hosted both half and full-day programs, and I taught Fun – Balance – Bracing and Games in the morning and Simplifying the Roll in the afternoon. Sunday’s programs were half day, and I instructed Complicating the Roll. Rescue practice is a great way to cool off on a sunny day. Evening entertainment included several intriguing presentations, and Saturday evening Danny Mongno hosted a very entertaining pub quiz game, which challenged coaches and participants both mentally and physically. 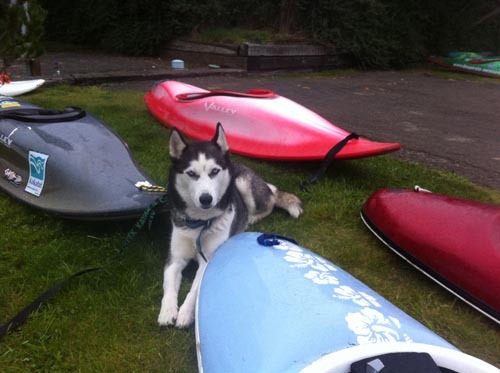 A very friendly dog takes a break by some kayaks. 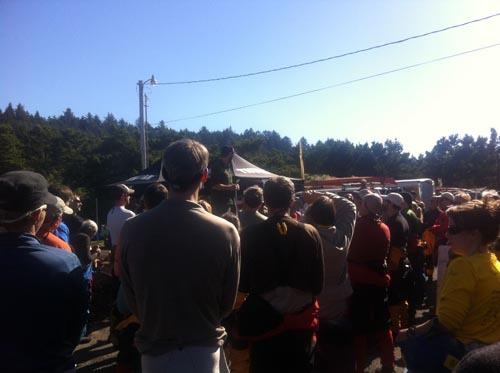 The event was incredibly well organized, and everyone was well taken care of. Special thanks to Paul Kuthe, Dave Slover and Suzi Elle for having me there! 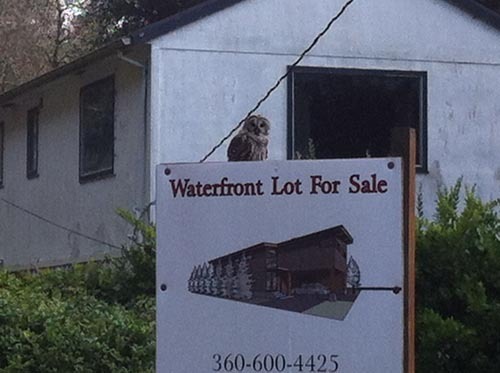 Unfortunately, most of my on-water pictures had a very large water spot in the middle, but I snapped this shot of an owl on my way out of town. 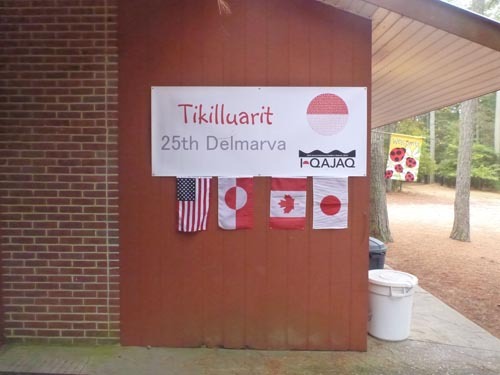 This year marked the 25th annual Delmarva Paddler’s Retreat, which took place last weekend on Rehoboth Bay in Delaware. This was my fourth time at this event and every year I’ve gone it has been an absolute blast. The event is organized by Robin Snow and Chris Beckman, and they do a fantastic job. 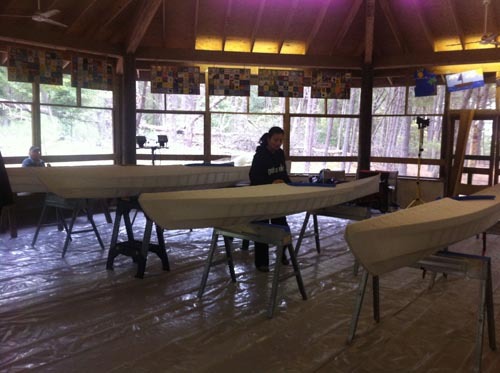 Several people arrived early to build kayaks with Brian Schulz. I arrived early to attend the Qajaq USA board meeting, and I stopped in a couple of times to admire the gorgeous F1 qajaqs that they were building. Wind waves cover the usually dry dock. What made this year a little unique was the weather. 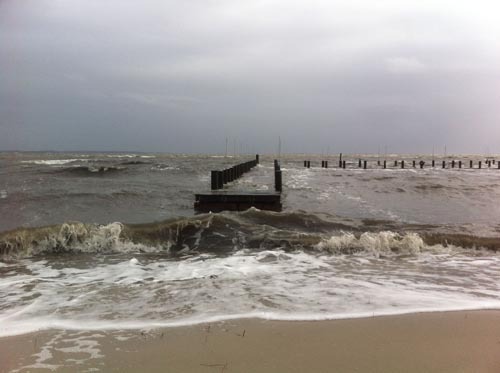 The usually calm bay was stirred up by wind and rain, which made the water quite challenging. Some chose to brave out the storm, which lasted throughout the entire event, while others chose a roll class in one of the camp’s two swimming pools. 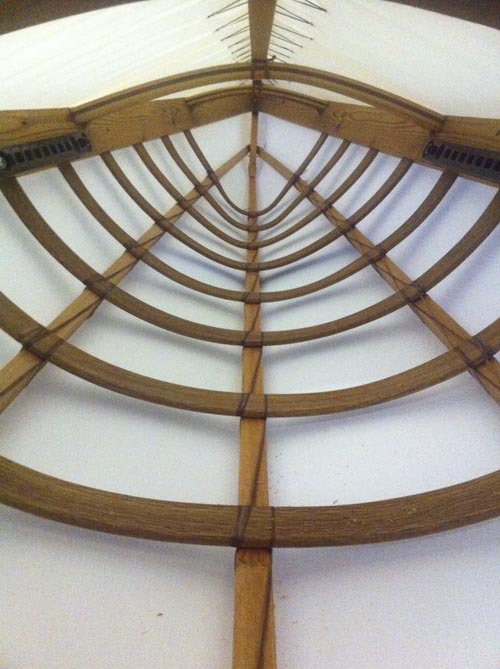 Others worked on Greenland Rope Gymnastics inside with Dubside or were critiqued on their strokes with Greg Stamer who was using an ergometer. 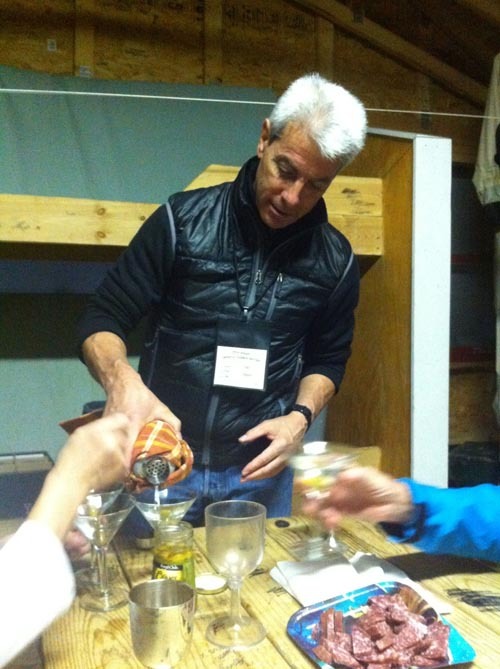 Dan makes a mean martini. Of course the weather didn’t prevent usual activities such martinis with Dan Segal, a fantastic silent and live auction and a raffle, which had some incredible prizes, two of which I was thrilled to win. Eiichi Ito presented on Greenland Kayaking in Japan, and James Manke gave a presentation on kayaking the Grand Canyon. Peter Gengler kept people entertained with his 3rd Annual Peter’s Shorts (If you don’t know what that is, I guess you’ll have to come next year). There was also a qajaq skinning demonstration taking place throughout the weekend. Each morning I ran Yoga for Outdoor People, and the rest of my time was spent in the pool, working with participants on everything from first rolls to sculling rolls. 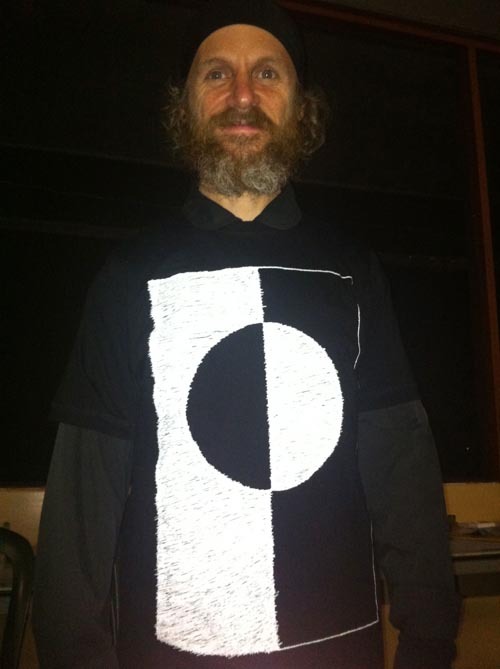 Dubside shows his new shirt. 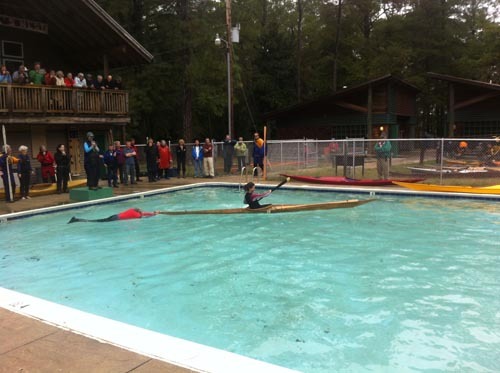 The usual Palo’s Wedding race began with a portage to the pool. It wasn’t easy though because Qajaq USA’s president Terry O’Malley aggressively chased racers with a hose. All in all it was a fantastic weekend. Thanks to the organizers for having me there, and to everyone who attended for creating such a memorable event. See you next year! Description: Topics that can be covered include first rolls, other-side rolls, layback paddle rolls, forward finish paddle rolls, norsaq rolls, hand rolls and beyond. 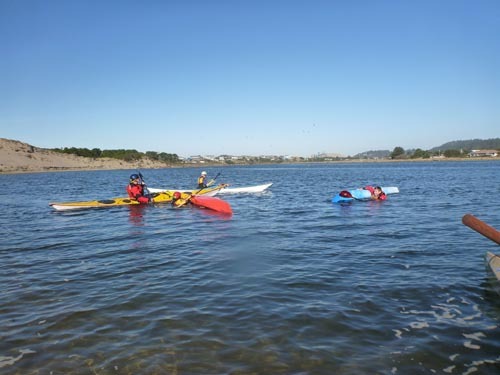 The techniques examined can be used with any type of paddle and any type of kayak. Contact: For more information, course fees or to register, click HERE.